Product #20648 | SKU QBOX | 0.0 (no ratings yet) Thanks for your rating! 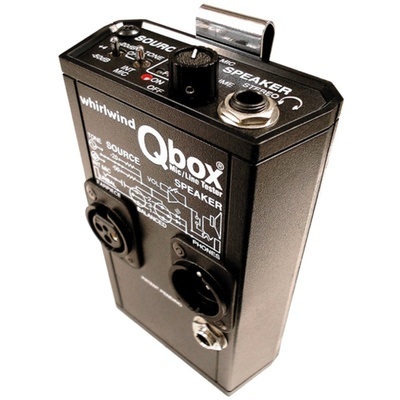 The Whirlwind Qbox is an in-line, 9V battery-operated beltpack audio testing utility device, designed for live sound, studio maintenance, and installation applications. The Whirlwind Qbox includes a microphone, a speaker, a test tone generator, outputs for standard headphones, a TT bantam jack, a 1/4" jack for a line-in or a 2k Ohm(telephone) earpiece out, along with voltage presence LEDs for confirming phantom or intercom power. The Whirlwind Qbox is suitable for multiple purposes including hands-free intercom use when connected to another Qbox. It provides a mic- or line-level tone for activating a signal path, or identifying a specific cable in a pile of cable ends, and can also be used to monitor a standard 3-wire intercom feed of talkback from the main audio console.